They say he’s from Hell – now is that the Christian version or the ancient Jewish version? Or the Greek version, or Nordic, or Moslem? Why, there are as many versions of Hell as demons from there. But enough about George Bush Junior. HELLBOY is a classic example of hype over-riding content. I am as big a fan of comics/graphic novels as the next geek-cheese, but I am also a fan of well-made movies, and for all its glitz and glam-blammo, HELLBOY (from the Mike Mignola comic) is not a well-made movie. Though the costuming, set dressing, cinematography are hot, the stunted attempts at humor, romance and plot construction leave us cold.During World War II, a gateway to hell was opened and a demon accidentally escaped. (Many would agree – they call him Adolf Hitler.) 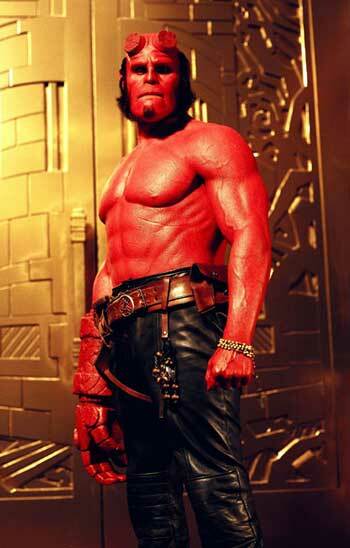 This demon was a “baby” with a brick fist, and a paranormal investigator (John Hurt) adopts and raises it to be Hellboy (Ron Perlman, pitch perfect), a warrior against supernatural forces on Earth. Director Guillermo del Toro slams a whole alien world on us, and some of it gets lost in translation. 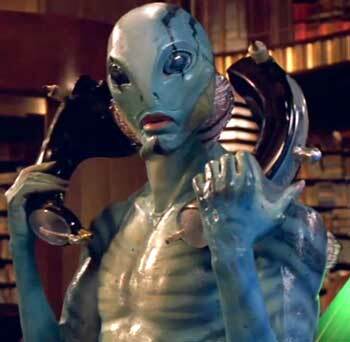 We wonder why we find the aqua-being, Abe Sapien (Doug Jones), so terribly familiar – until we realize he is ripping off C-3PO’s Worried Butler act. Selma Blair is Hellboy’s firestarter girlfriend, all gloom and blue flame. Jeffrey Tambor is hopelessly miscast as some curmudgeony guy in the paranormal agency. The plot lacks continuity and just plain sense. Rasputin (Karel Roden) – the Mad Russian Monk – skulks around with his buddy, Edward Scissorhands, trying to open a portal to hell with special effects, and Hellboy must dig up a corpse to help guide him to Rasputin’s lair and stop him. After Hellboy and his goth chick are cornered by Too-Much-CGI and she uses her power of fire to defeat the CGI, suddenly we are in another sewer-like lab with Hellboy strapped down and the fate of the universe in the balance. 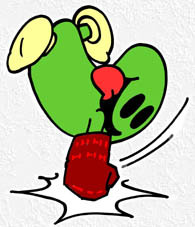 Slightly sudden. Apparently, Hellboy’s brick fist plays an important role in unlocking some gateway to Huge Savings or something and Rasputin wants to be the first in that door. You lost me at the speaking-in-tongues version of hello. The characters evoked no sympathy from me. As far as I’m concerned, Anthony Daniels should sue the fish guy. And I find it hard to believe that Selma Blair was the best they could come up with for the clinically-depressed goth chick – the casting call should have turned up thousands of this species in Orange County alone. The young detective (Rupert Evans) was a formless puddle. But John Hurt tried, I’ll give him that. And Rasputin chewed some scenery. Ron Perlman is the only person on earth who could have pulled off the lone, laconic, lantern-jawed Hellboy, and his tale is one of Grande Concept. It was just not executed terribly well. There are intimations of deeper messages, such as teen alienation and social outcasting, but they are not dwelled upon, and one of these “teen-love” scenes between Hellboy and his goth chick is one of those non sequitur brick walls. Writers: Mike Mignola, Guillermo del Toro, Peter Briggs. Starring: Ron Perlman, John Hurt, Selma Blair, Jeffrey Tambor, Rupert Evans, Karel Roden, Doug Jones, Brian Steele.